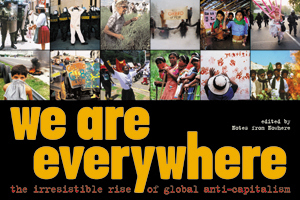 "We Are Everywhere"- the irresistible rise of global anti-capitalism" (Verso, 2003) Is out there! As events have swept from Chiapas to Seattle, Genoa to Bangalore, Quebec City to Buenos Aires, we have been busy working as activists and writers, story chasers and documentarians, and have somehow managed (between the organising and the teargassings) to capture and collect some glimpses of the crucial moments and inspiring stories from around the world. We wanted a way to document, broadcast, and amplify the sense of extraordinary possibility created by the multitudinous uprisings taking place across the world. So we combined our collective experiences, writings, ideas, and contacts to produce a book. We Are Everywhere is the result. It's a radical intervention in publishing - a celebration of direct action movements across the planet, unfiltered by the mainstream media, and told through the words and images of the people who were (and still are) there. Framing and connecting their stories are seven essays , written by the editors, which explain some of the defining characteristics of this movement. We've also included how-to boxes on direct action tactics. Running along the bottom of each page is a time-line of actions and victories which spans from 1994 with the Zapatista uprising to the present. Interspersed amongst everything else are gorgeous photographs, which capture the diversity and playfulness of our actions. These elements all add up to a real overview of the movement: where we came from, what we want, who we are, and where we're going. We Are Everywhere is history as it should be told. The Zapatistas, whose indigenous uprising inspired the world, have taught us, through their struggle founded on radical notions of dialogue and participation, to embark on a rebellion that listens. In this spirit, last year, we produced a 100 page preview booklet, "Notes from Everywhere," which we have given freely to activists at gatherings in Belgium, the UK, Bolivia, the US, Mexico, and Canada. The booklet was produced to inspire critique, ideas, and contributions to the final book, and this website aims to do the same. We Are Everywhere is anti-copyright, and will be available for free online. It is neither academic thesis nor art book, neither agitprop nor critical analysis, neither inspirational document nor DIY manual - but all of these, woven together using innovative graphic design and photographs. Texts, images and interviews with activists merge in both printed word and this website, creating a lively, polyphonic insight into the ideas and activities of the movements against capitalism and for life. We hope the result proves to be an inspirational, authentic document of insurrection. Que se vayan todos: Argentina's Popular Rebellion - a recent publication by some of the editors. Please note that this site is currently under construction and some sections are still unfinished. These will be added soon. An eyewitness account of the financial meltdown and ongoing grassroots rebellion. A NEW edition, with an update, 16 page tabloid size publication, complete with fantastic full page images of the popular rebellion in Argentina. If you would like copies write to quesevayantodos@gn.apc.org - stating how many you would like, and your address. Or to download the text click left.